This past May I attended the annual general meeting of the Canadian Historical Association (CHA) at the University of Waterloo and the EH+ 2.0 Graduate Writing Workshop at McMaster. At the CHA I attended a roundtable titled “Macro-Theories of Canadian History: A Round Table on the Staples, Metropolitan and Laurentian Theses.” The discussion during the panel largely focused around the limitations of grand theories in history in general and Canadian history in particular. Panelist Doug Owram made an interesting offshoot comment about current relevance: there was a time, he mentioned, when Canadian historians such as Ramsay Cook could write to the Prime Minister and expect a response that was not boilerplate. Given today’s current political climate, perhaps one would not want to lay claim to being the historian that has Stephen Harper’s ear – given his recent attacks on the environment, women, First Nations, and academics – but it’s clear that historians do not have the same clout in Canada as we once did. The writing workshop run by Michael Egan and Claire Campbell in Hamilton discussed various issues, including the fact that many articles and books by historians do not reach a wide audience. Historians are professional storytellers but in recent years we’ve lost our voice. Journalists and other writers have done a better job not only telling the stories but also reaching the general public. What can be done to shake things up? I’ve got a couple of ideas. My experience at these two forums led me to ponder questions of relevance and audience. Are Canadian historians doing enough to stay relevant and if so, what are they doing? Moreover, if we are not reaching people through our written work, what else can be done? But fear not – this is not a doom and gloom piece. I would argue that many Canadian historians, especially the younger ones, are staying relevant through a variety of mediums and are reaching audiences within the academy and beyond. Current scholars have found excellent ways to connect in more innovative ways. Take this group blog, for example. ActiveHistory.ca averages 10,000 individual hits per month and reaches academics, teachers, students, and the general public. Many historians now have their own blogs that they use as a teaching resource or as another general outreach method in order to stay connected within the field and their community. Yet the sharing and dissemination of local knowledge is probably one of the most effective ways that historians can stay relevant. We have been taught to think macro, to strive for journal publications and book contracts. Although these are integral for professional development we must also think micro. Cultivating historical knowledge at the grassroots level in our respective communities is one of the most effective ways that we can make our research and studies matter. Relating our work to contemporary matters that affect our community and beyond will ensure that our work is read. It will also ensure that we are looked to as authorities on subject matter related to our various locations. While focusing on our larger projects we still need to connect with people on the ground level. Writing for group blogs, recording podcasts and organizing local lectures or seminars are great ways of doing this, but there is another non-conventional way of reaching the general public, which many of us inadvertently already do. 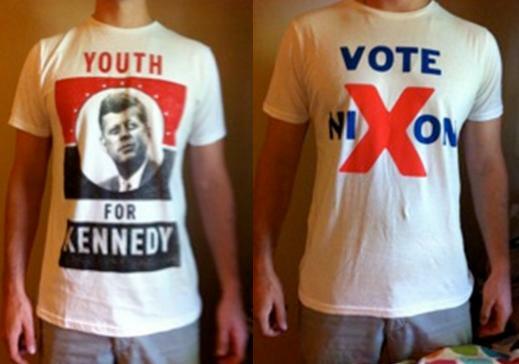 Recently, I purchased some t-shirts from Urban Outfitters, featuring the presidential campaigns of John F. Kennedy and Richard Nixon, pictured below. Whether or not the company actively tried to promote engagement with American history or not, this is precisely the result. When wearing the clothing article, someone may engage with you about why you bought the shirt or what it means. The initial curiosity brought forth by the shirt’s evocative graphics or message can then lead to a discussion of either American history or the current political landscape. Either way the shirt provides the means for an intimate knowledge transfer that might not have otherwise taken place. Author wearing American history. Photo by author. Using your attire as a historical tool might be novel but the communicative power of clothing is not. It is one of the most common forms of non-verbal communication. For example, the type of clothing that an individual wears may convey clues about his or her personality, background or financial status. Historians have already cornered markets of dissemination such as writing, audio, visual, and oral communication – but historically- themed clothing is an underdeveloped avenue. It potentially represents the greatest audience, as Statistics Canada found that Canadian “consumers spent $307 billion in retail stores in 2002, with clothing and accessories representing almost 7% of the total, or around $21 billion.” However, my post is not concerned with the revenue potential of clothing, but rather the communicative power that it can have as a historical device. Long before I bought the Kennedy and Nixon shirts, I recognized the expressive ability of clothing as a historical source. 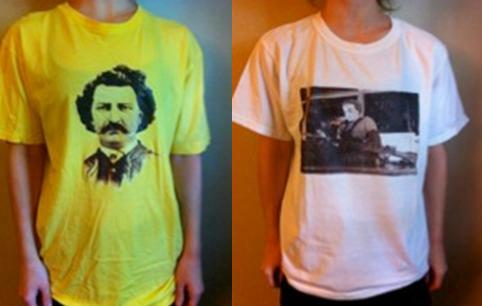 I made my own shirts featuring iconic images and people in Canadian history such as Veronica Foster, best known as “Ronnie, the Bren Gun Girl” and Louis Riel. The shirts were quite rudimentary (they were made using iron-on paper), but the idea was to use my attire in order to get people thinking critically about the place of gender in wartime Canada and the Red River and Northwest Rebellions. Chantal Longchamps modeling Louis Riel and Veronica Foster. Photo by author. Last year as I laboured through comprehensive exams I created a Harold Innis shirt. This shirt has surpassed the earlier ones not only in terms of quality but also as a catalyst for discussion. 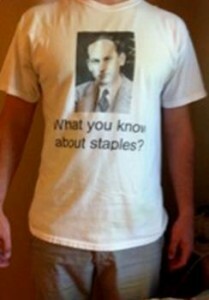 Author conveying the staples thesis by wearing Harold Innis. Photo by author. When I first wore this shirt around my non-academic friends, the first response was “let me guess, that’s an inside joke that only you get?” Yet everyone was still intrigued. Before long, and without serious prodding, we were discussing Innis’ contribution to Canadian history vis-à-vis the staples thesis! Many of us might be reticent about wearing or producing shirts with links to our research or other historical tropes because it might be perceived as the ultimate nerd beacon. We don’t all need to start wearing Riel and Innis on our sleeves, but this is another outlet where history can be transmitted at the most basic level. At the CHA roundtable mentioned above, Christopher Dummitt stated that “if any discipline ought not to be trendy, it’s us.” We should not be afraid to break new ground and be bold. While we as historians should still continue to think big by writing peer-reviewed articles and books, we should also consider tapping into unconventional methods of dissemination – such as clothing – without the apprehension of being seen as trying too hard to be hip. Correction: an earlier version of this post misquoted Christopher Dummitt (see the comment section). I was, though, referring to not assuming that the latest idea/book is the best. I’m all for historical T’s, trendy or otherwise. Thanks. And I should actually mention that appears to be a mistake on my part as in an earlier draft I had the quote as you had written it here. I also realize you were speaking to a different issue entirely so in this case your quote is taken out of context, my apologies. But glad you are on board with the historical t-shirts. Great piece, Mike – you know I’m on board with this idea as well as the broader question of historians engaging with the world around them. Too many people are worried about seeming to sell out when they write op-eds or do popular history. It’s a good idea to let the public see how the same scholars can be both professionally esteemed and publicly accessible. Keep up that work and the snazzy wardrobe choices! Thanks for reading this piece and for the great feedback. I agree completely. At my stage right now I’m finding that doing the op eds or other public outreach pieces is helpful and rewarding while I’m waiting to hear about the status of articles I’ve submitted. Glad you like the attire, I might have to do another one soon. I did the Innis shirt in 2011 so I think it’s time to update my collection. In interesting thesis, yet making historical statements through apparel is not a new concept. People throughout history have expressed their political alliences through aspects of their clothing and people have been collecting ephemera such as political pins for over a century. If you are interested in the topic, you can find references to these topics in Fashion history books or through organizations that deal with the collection of pins, patches, medals, uniforms, etc. Thanks and yes I also realize that making historical statements through apparel is not a new concept but I was just trying to argue that consciously trying to convey Canadian history via a Louis Riel shirt (for example) could be another interesting way that historians can connect on the ground-level.